At 2.9 million square feet (270,000 m2), it is the city's fourth largest building in terms of floor area as of 2014[update]. It was the largest building until 1963 when the 3.14-million-square-foot (292,000 m2) MetLife Building opened. The World Trade Center (which opened in 1970–71) and 55 Water Street 3.5 million square feet (330,000 m2), which opened in 1972, were also larger but the World Trade Center was destroyed in 2001. When the 3.5-million-square-foot (330,000 m2) One World Trade Center opened in 2014, 111 became the city's fourth largest building. The building was designed by Lusby Simpson of Abbott, Merkt & Co. and completed in 1932. The building had a multipurpose design when it opened in 1932 with the first floor and basement designated as "Union Inland Terminal #1" which was to be used to transport goods by truck to and from railroad lines and/or shipping piers. The second floor was the Commerce section designed for exhibitions and the upper floors were designed for manufacturing. The Union Inland Terminal was built by the Port Authority to be a warehouse/union station to handle less than carload (LCL) shipments, consolidating the shipping functions of the Hudson River piers two blocks west of the building, the eight trunk railroads that operated a block west of the building and truck operations (an inland terminal by definition is a warehouse that is not immediately next to railroad lines/piers but is nearby and is used to relieve congestion at the transfer points). At its peak in the 1930s the Port Authority said it was handling more than half of the LCL freight operations south of 59th Street in Manhattan with more than 8,000 tons of goods passing through it each month. On one day alone in 1937 it was reported that 650 trucks had used the facility. The railroads involved were the Pennsylvania Railroad; Lehigh Valley Railroad; Baltimore & Ohio; Erie Railroad; Delaware, Lackawanna & Western Railroad; Central Railroad of New Jersey; New York Central Railroad; New York, New Haven & Hartford. The building included four freight elevators that could carry fully loaded 20 ton trucks. Because of the warehouse mission of the building it was able to avoid some of the setback rules that greatly reduced the buildable space available for the skyscrapers that mark the Manhattan skyline. As a result, the 15-story building with its football field size floors has more available rentable square footage than the 102-story Empire State Building which has 2.2 million square feet. The construction occurred at a time of a massive projects built to deal with what at the time was street level freight railroad traffic on Manhattan's west side. Other projects in the neighborhood in the era included construction of the High Line and Starrett-Lehigh Building. The initial plan had called for more inland freight operations to be erected in Manhattan. However the freight transportation changed and freight railroads played a dwindling importance in Manhattan. By 1947 its initial mission was pretty much abandoned and it became the Port Authority Building which remained the Port Authority's headquarters until the opening of the World Trade Center in 1970. The massive building served a dwindling warehouse/backoffice outpost until 1998 when Taconic Investment Partners acquired it. Taconic began marketing it as a location to be used as a carrier hotel for the new booming internet business. This was coupled with the fashionable rise of the Chelsea neighborhood that surrounded it. In 2010, Google, which had previously leased space in the building, contracted to purchase the entire 2,900,000-square-foot (270,000 m2) building, in a deal reported to be worth around $1.9 billion. The building's meet-me room in its carrier hotel was once the biggest in the city (the other big meet-me room is at 60 Hudson Street). 111 8th Avenue is adjacent to trunk dark fiber lines stretching from Hudson Street and continuing up Ninth Avenue. That line at the time was owned by Lexent Metro Connect. There was speculation at the time of the acquisition that Google would use its strategic location to launch a Google Fiber operation in New York City. The Google Fiber plan never came to pass and Google has denied it has any plans to bring it to New York City anytime in the near future, although in 2013 it did begin offering free Wi-Fi to its Chelsea neighbors. The Lexent dark fiber line has been acquired by Lightower Fiber Networks. In 2013 the first class of the newly created Cornell NYC Tech school began classes in the building, in space donated by Google. Classes continued in the building until the school moved to its new location on Roosevelt Island in 2017. Despite the massive size of the acquisition, Google has still found itself having to rent space elsewhere because it has been unable to break the leases with some of its tenants, including Nike, Deutsch Inc., and Bank of New York. After years of renting additional space across the street in the Chelsea Market, Google purchased that building in 2018. ^ a b c d e Gustin, Sam (December 22, 2010). "Google Buys Giant New York Building for 1.9 Billion". Epicenter (blog of Wired). Retrieved May 2, 2012. ^ a b White, Norval & Willensky, Elliot (2000), AIA Guide to New York City (4th ed. ), New York: Three Rivers Press, ISBN 978-0-8129-3107-5 , p. 183. ^ a b c d e f g "Railroad Operated Pier Stations & Inland Freight Stations of Manhattan". Members.trainweb.com. Retrieved May 24, 2013. ^ a b c d e f g h "NYC Commercial Real Estate - Page 73". Wirednewyork.com. Retrieved May 24, 2013. ^ Holusha, John (October 24, 1999). "Commercial Property /111 Eighth Avenue; Developers Taking a Manhattan Formula to Chicago". The New York Times. Retrieved May 24, 2013. ^ Miller, Rich (January 19, 2010). "Google Leases More Space at 111 Eighth Ave". datacenterknowledge.com. Archived from the original on December 1, 2010. Retrieved December 3, 2010. ^ Miller, Rich (December 3, 2010). "WSJ: Google Is Buying 111 8th Avenue". datacenterknowledge.com. Archived from the original on December 30, 2010. Retrieved December 3, 2010. ^ Bagli, Charles V. (December 2, 2010). "Google Signs Deal To Buy Manhattan Office Building". The New York Times. Retrieved December 3, 2010. ^ a b Optical Networks/WDM - Hui Pan, Editor - Google Books. Books.google.com. Retrieved May 26, 2013. ^ Alex Fitzpatrick (January 8, 2013). "Google Rolls Out Biggest Free Wi-Fi Network in New York City". Mashable.com. Retrieved May 26, 2013. ^ Geiger, Daniel. "Nike to Google: Just Drop Dead". The Commercial Observer. Retrieved May 26, 2013. ^ "Cornell's NYC tech campus finds temporary home at Google". Cornell Chronicle. Cornell University. 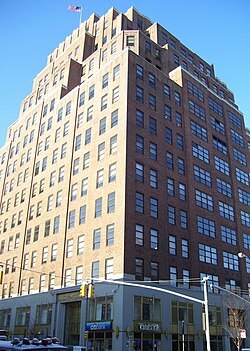 Wikimedia Commons has media related to 111 Eighth Avenue.